My son asked, “Why is it so busy when it’s so late?” We had arrived in the city that never sleeps, that’s why! In a busy city filled with so much to do, creating an itinerary for two nights and one day is daunting. I have visited New York numerous times, but this was my 7-year-old son’s very first visit to the Big Apple. So, we focused on the big ticket stuff to make sure we enjoyed our stay and didn’t feel rushed. Here’s how to make the most of New York City in one day. Central Park gets all of the glory for its beauty, its massive size and plentiful activities. On a short visit to New York City, however, a visit to Bryant Park is more manageable. Plus, it’s gorgeous, especially at night when lit up by the twinkle of lights in the skyscrapers above. In winter, there’s an ice skating rink and vendor booths with the feel of a European Christmas market, peddling wares (tree ornaments, mittens, jewelry and more) and good things to eat (like fried pickles!). In summer, Bryant Park makes an ideal spot for an ice cream and a spin on the carousel. When you imagine New York City, what image appears in your mind’s eye? The Statue of Liberty, of course! I’d visited Lady Liberty before, once as a teen and once on a float-by Staten Island Ferry visit as a 20-something. A first-time visit to the city, however, would not be complete without a trip to view this symbol of freedom. Located on Liberty Island, the only way to reach the statue is via the Statue of Liberty – Ellis Island Ferry system. Going to see a Broadway show should make any itinerary for visiting New York City in one day. My son and I were delighted with our tickets to “Finding Neverland.” This musical brings to stage the real life of Peter Pan creator, J.M. Barrie, and his muses, the beautiful widow Sylvia and her four sweet but mischievous young sons: Jack, George, Michael and Peter. 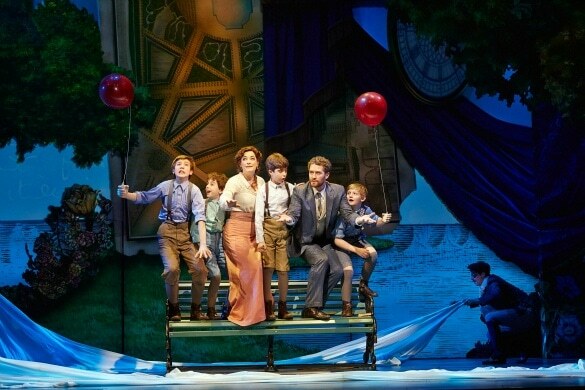 Billed as the most magical musical on Broadway, parents should be aware (spoiler alert!) that the musical concludes with the death of the boys’ mother. I was warned in advance that “Finding Neverland” may be best suited for children ages 8+ but my second grader sat in rapt attention throughout and did not seem overly saddened by the ending. I’d never heard of the show’s star, Matthew Morrison, but I left in love with his good looks and the charm of the J.M. Barrie character he portrayed. Morrison is a Tony award-nominated Broadway actor, who is probably best known for playing Will Schuester on the television series, “Glee.” His last Neverland performance will take place on January 24, 2016. The bright lights, big city vibe of New York is nowhere more apparent than in Times Square. Times Square is so named for the New York Times, which is headquartered there. 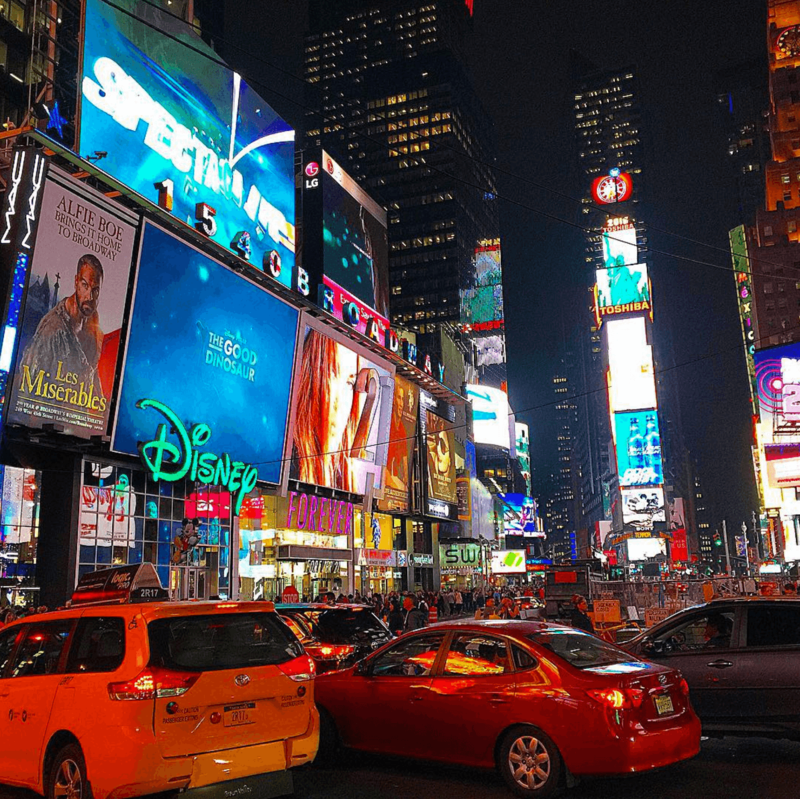 Located in Midtown at the junction of Broadway and 7th Avenue between West 42nd and West 47th Streets, Times Square has also become the headquarters of all things flashy and over-the-top. Want a photo with Elmo, the Naked Cowboy or a myriad of Mickey Mice? Times Square is your place! (For a few bucks, that is.) You’ll also find giant electronic billboards, hurried pedestrians, non-stop traffic and shopping opportunities aplenty. If traveling with kids, be sure to pop in to the giant M&Ms World for a sweet souvenir and the two-story Disney Store for a glimpse of Disney magic in New York City. Rockefeller Center is another iconic New York City attraction for first time visitors. 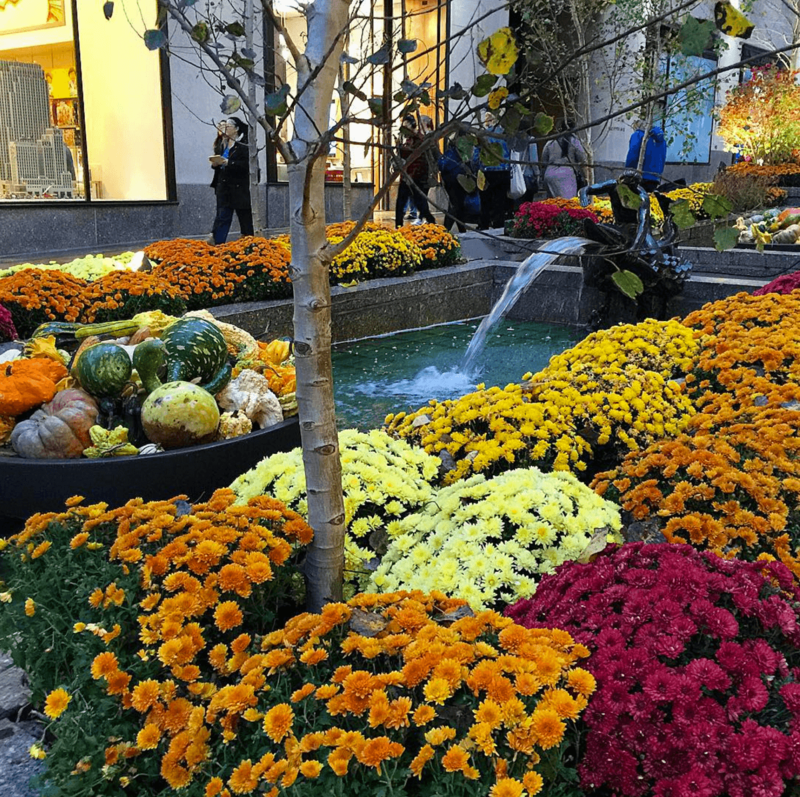 Purchase a ticket to the Top of the Rock observation deck for a fantastic view of the city, or just wander through the shops and Channel Gardens with its live displays that change with the seasons. If visiting New York during the winter, Rockefeller Center is an absolute must, if only to snap a photo of that glorious Christmas tree. The famous ice skating rink is open October through April each year, but the cost to skate on the small rink is hefty so you can skip it unless it’s a bucket list item for your brood. You could spend your entire day eating your way through New York City and leave a happy traveler. Looking for a ritzy happy hour? For light bites and tasty cocktails with a side of chic style, check out Measure Lounge at Langham Place New York. 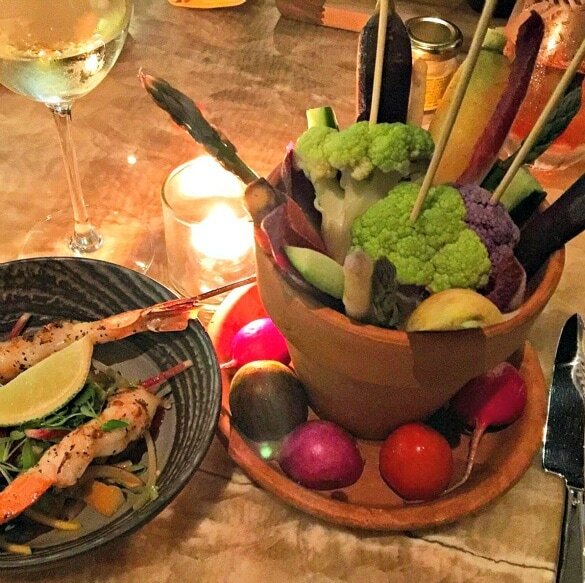 You might even convince picky children to eat their veggies with Measure’s crudités served in a flower pot. I wanted to be sure to squeeze in some face-time with The Globetrotting Travel Mama during our short NYC vacation. We planned a meet-up at the boisterous Tony’s Di Napoli because my son’s a picky eater who likes Italian food, it was recommended by my friend and author of Fodor’s New York City with Kids, and it’s in the Theater District – making it a good pre-Broadway show choice. Lyla and I had never met before in-person, so it was a real treat to share a family-style dinner of chicken piccata and spaghetti with meatballs with her and her adorable daughter. On a previous visit to New York City, I fell head over piedi with another Italian option, Eataly in the Flatiron district. More than merely a restaurant, Eataly is an Italian marketplace with all sorts of tasty goodies to purchase to bring home, and nooks filled with restaurants and cafes for on-site dining. My son and I stopped at Bouchon Bakery near Rockefeller Center for some tasty treats. He swooned over the Thomas Keller croissant. Meanwhile I nibbled on the best-ever macarons and the most crave-worthy Salted Caramel Peanut Popcorn, both of which just happen to be gluten-free. Got limited time but want to make a big impression? Any child or adult is sure to remember (longingly!) Langham Place New York. With a swanky Midtown location, a stay here puts your family smack in the center of everything you could want to do in the city. The Langham’s signature color is pink (my favorite!). 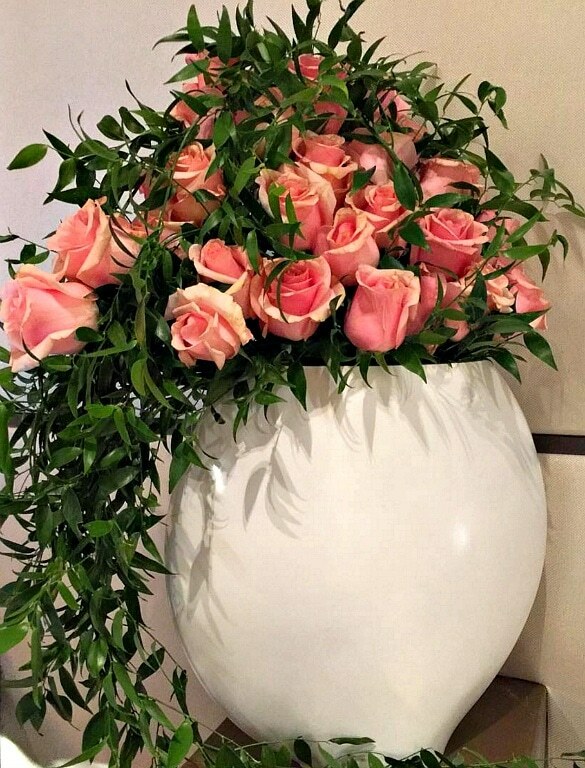 I loved seeing subtle hints of this rosy color in floral displays, on the room keys, and in their pens. Yes, I did snag a few of these writing utensils to bring home! Expect impeccable customer service, high tech touches (like a TV in the bathroom mirror! ), and a sleek, yet luxurious vibe. Before checking in, the concierge asked for my son’s name and age and we were greeted with a chocolate chip cookie with “Leo” spelled in icing in our Family Place suite. In the mornings, complimentary coffees, teas and biscotti were offered in the lobby and in the afternoons, hot chocolate with fancy fixings and cookies. Guests are invited to get one pair of shoes polished at no extra charge every day of their stay; I left with my leather black boots shining on my feet. Sound like your kind of place? Check out their special packages. 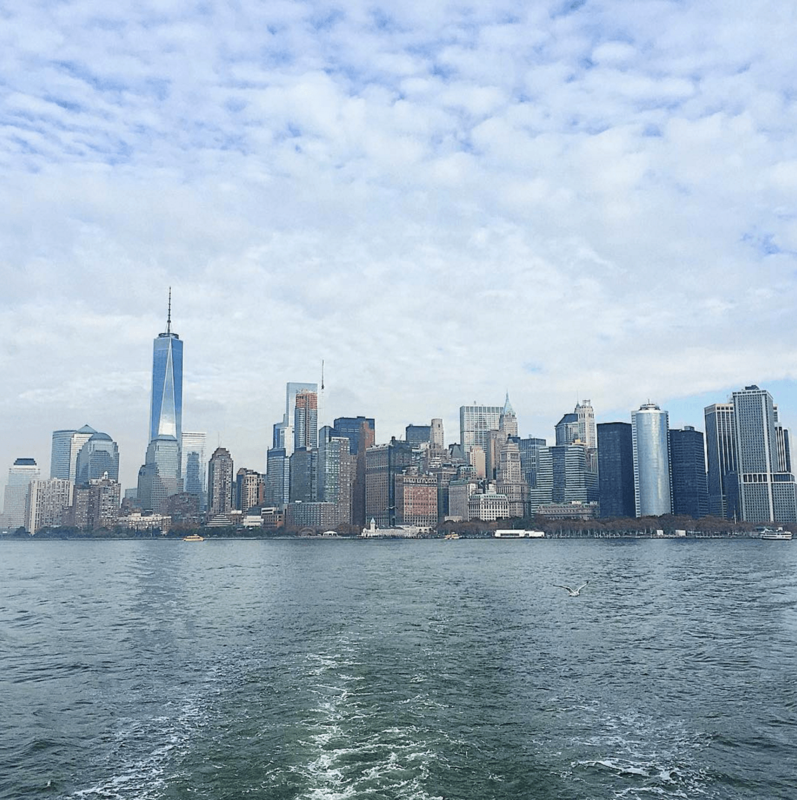 We packed a lot of New York charm and memories into our brief mother-son vacation before boarding Royal Caribbean Anthem of the Seas for a two-night media sailing. It was just a large enough bite of the Big Apple to make us both long for a return trip to NYC! What attraction or activity would be on your must-see list when visiting New York City in one day? Let us know in the comments below! 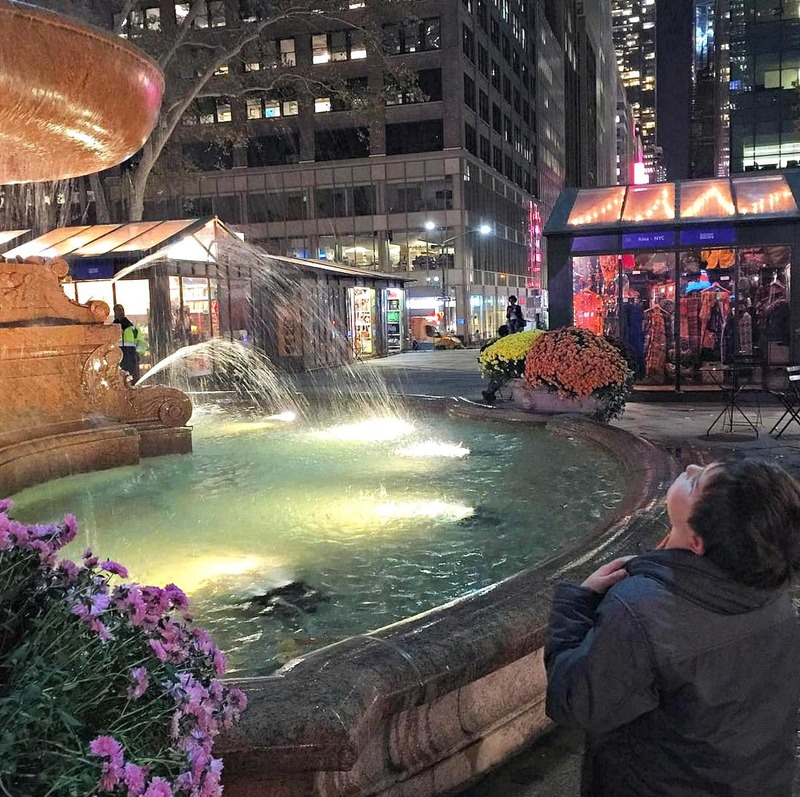 A Note from The Travel Mama: Thank you to Langham Place New York and “Finding Neverland” for hosting our New York City in one day vacation. I purchased all activities and meals myself. All opinions are mine, as always. Yes! New York is a very busy city. Your article is very nice. The Statue of Liberty and Bryant Park are very beautiful places. Thanks for sharing this great moments. Robin – Thank you for your comments! Ahmed – The TV in the bathroom mirror was pretty awesome! Happy New Year to you! We would love to do all these things – our kids are really keen to go to New York, but I would hope to stay for a few days to pack as much in as possible. 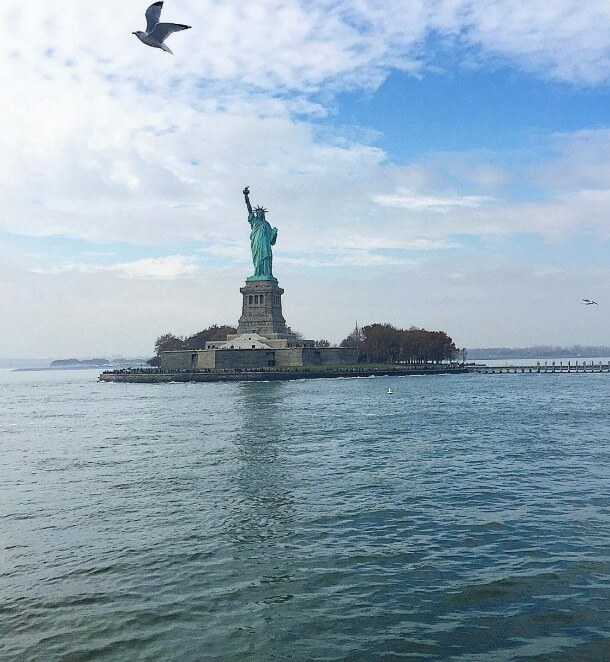 The Statue of Liberty and Ellis Island would be right at the top of our lists, plus some shopping and a show (I can’t believe you never say Matthew Morrison in Glee; he was terrific!). I haven’t watched much of Glee. Maybe I should with my music-loving tween, though?! I did all of these when I visited New York, but I actually didn’t hear about Langham Place. Sounds ideal. Athena, my daughter would love it, including the pink! Lesley – I’m sure you and Athena would love Langham Place! You managed to experience a lot in just one day! I haven’t taken my kids to NY yet, but they really want to go. I’ve been to the Statue of Liberty but didn’t have time for Ellis Island, so that is definitely on the list. 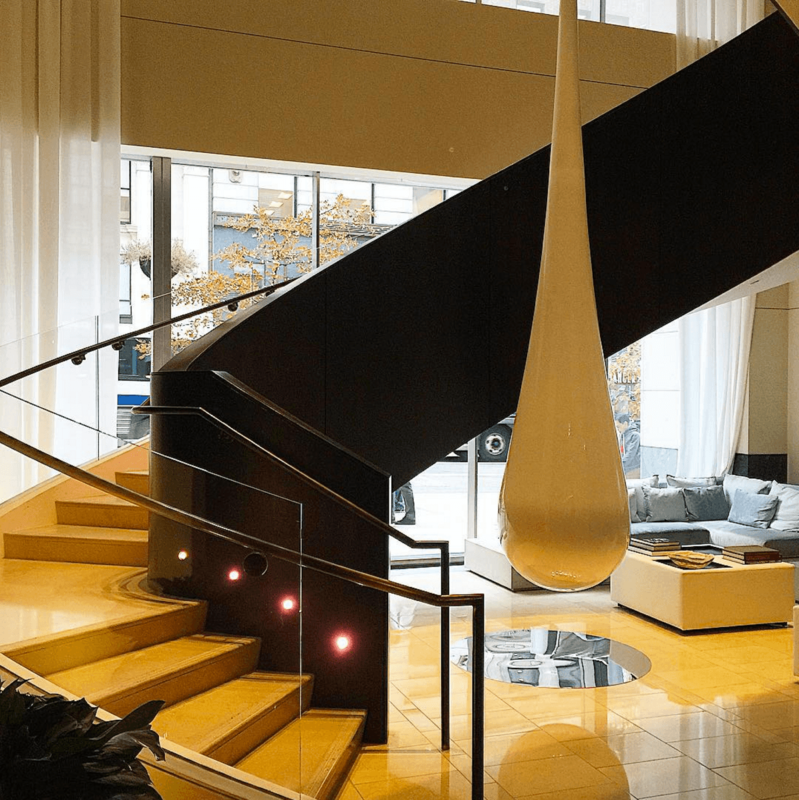 Langham Place looks like a great place to stay – thanks for the recommendation! Dana – I bet your kids would LOVE NYC! And Langham Place! One day in NYC is ambitious, but sometimes you have to work with the time you have. This looks like a fun mix of well known attractions and hidden gems. How fun to share this day with your son! Sounds like a fun trip! We always try to go to Dylan’s Candy Bar (and now we know there is a subway stop nearby!). I also loved visiting Eataly when I was there over the summer. Kath – I don’t think I’ve been to Dylan’s Candy Bar yet (besides their airport store). Next time! Jolanta – That sounds like a lot to me! There’s so much to explore in NYC…sometimes you just have to pick and choose! Busy day for many but I know it’s all doable because we go at least once a year and also frequent many of these. Statute of Liberty boat trip gets you some incredible Manhattan views (like in your last picture:)…All of your suggestions are great, except I would trade Times Square for Met Museum- there is a lot to see there and kids will be sure to love certain exhibits (and admission is by voluntary donation). Victoria – I love the Met! I know my kids would love it, too. They are both quite the little artists. I hope to squeeze that in on our next visit to NYC!